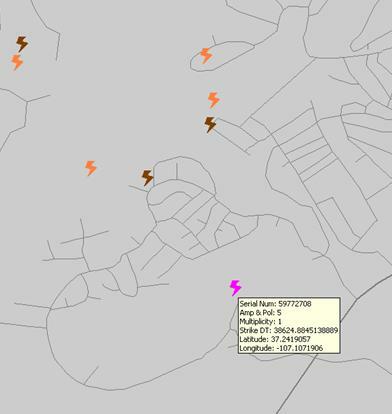 The Lightning Strike Application for GTViewer shows current lightning strike data over your facility and landbase data. This application is not only a good illustration of using GTViewer as a GIS development platform, but it also shows off the capabilities the GTI Data Monitor with a real world application. The Data Monitor is a part of GTViewer that can display a large number of temporary items on top of your GIS data. These items may update their position frequently (as when showing Truck or Crew locations) or may have a limited lifetime (as with lighting strikes). The lightning strike information is only valuable for a short time period. Once the strike has aged, the information is no longer of value and can be discarded. Data Monitor items are not permanent features like Redlines and while this application could be implement by drawing redlines at the lighting strike locations, the Data Monitor is more efficient and provides more features than redlines can for this type of information. The Lightning Strike application is very simple. It reads data from a lightning strike data source and then updates the data monitor items. Lightning Strike items are symbolized based on their age. Once the strikes have reached a certain age, they are automatically deleted. 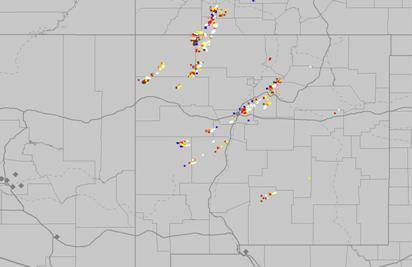 The lightning strike data can be updated at regular intervals to show a current view of the storm condition and provide additional support for critical decision making. The examples shown below cover for a very large area (most of North America), while a real application would be for a much smaller area. The first screenshot shows a bird’s eye view of the United States. 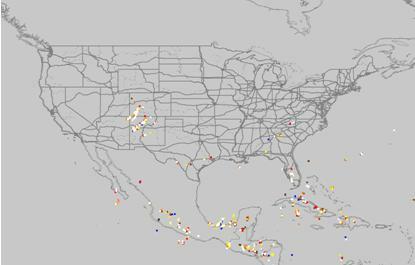 The colored dots represent the Lightning Strike Data Monitor items covering a 2 hour period. If we zoom in to a specific area of the map where the lightning strikes are concentrated, we can get a better view of the storm pattern. The color of the lightning strike is determined by its age. White is less than 30 minutes; Yellow is less than 50 minutes; Red is less than 70 minutes; Orange is less than 90 minutes; Brown is less then 110 minutes, and Blue is greater than 110 minutes. The Lightning Strike application involves more than simply running the Data Monitor. The Lighting Strike data must be acquired from somewhere. Some electric utilities have their own equipment for monitoring lightning strikes, but there are also services that provide this information for a monthly fee. For this application, the lightning strike data was provided by WeatherTAP.com. 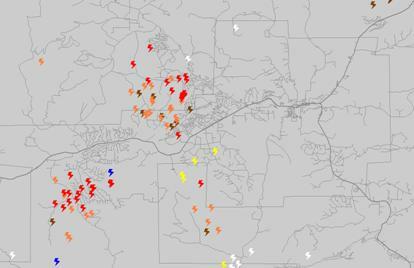 They can provide current lighting strike data via the internet for a minimum area of 50 x 50 miles. Cost is based on a per user basis and on the size of the area being monitored. Detailed information (as shown in the tooltip above) is extra. The Lighting Strike application is a good example of how the Data Monitor can be used in a practical example. This application also contains a pattern that can be used for a variety of tasks other than monitoring lightning strikes. This pattern is: load data from a source (a file, the internet, etc. ), then create data monitor items from the data. Already, the Lightning Strike app’s pattern has been applied to other applications for showing work ticket locations, and another for Siren locations.